Here’s another Congolese soukous guitar tutorial, it’s entirely a sebene break in itself. I play it in my usual kind of fingerstyle, with fingerpicks & a thumb pick. 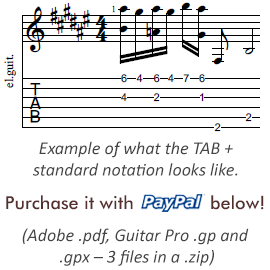 Please feel free to download the tablature at the end of the article, if you would like to practice and learn the song! If you aren’t yet familiar with the soukous genre, it originates from a couple of different Sub-Saharan African music styles that – as a first step – influenced Latin American music. Later – much, much later – a certain Latin American genre from Cuba called “Son” has re-influenced the local music style of the Congo Basin, in Africa. This was in the 1940s and this is the time of when we date Congolese rumba from. Confused yet? Me too. Anyway, soukous evolved from that Congolese rumba throughout the 1960s and on. The song of our current lesson in the key of C major, and its chord progression is I-IV-V-IV; I-IV-V-IV, if expressed with scale degrees. The beginning part of the song is all about a single line melody. In the case of our song, the first section is also played around the 12th fret, higher up the fretboard. You can say that technically the whole lesson is a sebene. It is a repeated musical phrase/theme in soukous music that’s composed to stand out and serve as an instrumental break. You’ll notice that because of the syncopating nature of the piece, the accents of each phrase in the 1st section are delayed by a 16th note. It adds an interesting effect to the tune that creates a feeling of movement. There are no string skipping moments in this section, the whole line is rather linear. All you have to be careful about is to find a sequence for your fretting fingers with which you can play the line from beginning to end, without mistakes. The 2nd section of the song is all about letting it smooth and ringing and sort of thick sounding. Even though you’re technically playing two notes at once, dyads or double stops, you can make this part sound like an orchestra. Okay, that might be a bit of an exaggeration, so what about a piano? Something like that. -.- The tricky part comes in the form of hammer-ons and pull-offs. And sometimes just pull-offs alone. You need to pull-off those note with enough strength so they are perfectly audible. Don’t cheat with a compressor during practice! It’s enough if you cheat with one once you have learned the piece inside out. When each note of the double stops can be heard, you know you’re on the right way.